Hello there! It's Mendi here and I'm really excited to share a layout I created featuring Doodlebug's chunky twine! As soon as I saw this I knew it would be so cute rolled up into candy swirls and lollipops! I must say that I always wanted a giant rainbow swirl lollipops as a kid and I never did get to try one. Now that I'm an adult they probably wouldn't be my candy of choice, but they sure do look pretty, don't they?! To create my candies, I added Beacon's 3-in-1 liquid adhesive to a piece of white cardstock and then starting from the center and working my way out, rolled the twine in a circle. When it was about the size I wanted, I simply snipped my twine and fussy cut around the cardstock backing with my scissors (trying to get underneath a bit so that the cardstock wouldn't show through). To keep the ends of my twine from unraveling, I added a bit of Ranger Multi Medium Matte. Like the name suggests it dries with a matte finish so you can't see where it's been added and it's pretty wonderful. I then decided I needed some cupcakes to set my little scene so I die-cut some on my Silhouette using pretty tone-one-tone prints from various 6x6 paper pads and the Swimming Pool Petite Prints for the frosting. I decorated my cupcakes with sprinkles and buttons and some stitching on my sewing machine. Scattering some jelly beans sprinkles from the Bunnyville collection was the perfect finishing touch! To create my banners I traced around the banner sticker from the This & That sticker sheet onto the back of one of the papers from the Spring Garden collection. For a couple of my candies I also wrapped them in some clear cellophane by cutting up a Wilton clear treat bag. 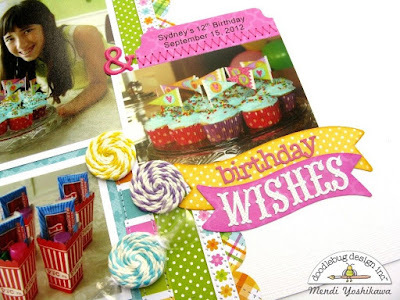 I just love how you used the twine on this layout, Mendi! Mendi has done an outstanding job on this layout - the way she has used the chunky twine and other details as accents is just so GENIUS!! OMG Mendi you sure did create on Super Gorgeous and Fabulous Layout!! You sure got ever so clever and creative with all these awesome goodies...you truly did a super outstanding creative job!! YOU so ROCK!! This LO is delightful, fun and super creative! 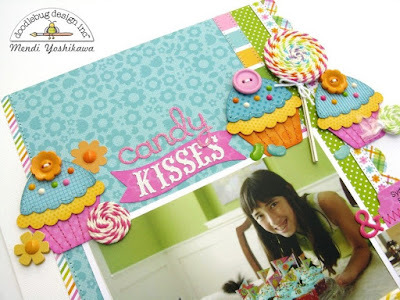 Those chunky twine candies and lollipop are the perfect addition to this sweet page!